Aside from the Digg buttons and widget generators that Digg recently made available as part of the preparation for the launch of its redesigned page, the social bookmarking site has also released a new iPhone app. And mind you, it’s a pretty cool and useful app that brings in all the Digg good stuff that we all enjoyed and have grown to love through the years. In fact just a few hours after it was released, the new Digg for Â iPhone suddenly goes to the top of the iPhone Apps Store’s “news” category. Â We don’t have exact download figures yet, but the fact that it went to the top of the apps chart is an indication that iPhone users are digging the new Digg app. If you haven’t downloaded it yet on your iPhone, now is the right time to do so. If you’ve loved Digg.com, I’m pretty sure you’d also love this Â Digg iPhone app. Why? You can watch the attached video above demonstrating the many cool and touchy features of the Digg app. Digg for iPhone app lets you browse lists of recent content, search for the topics you care about and save stories to check out later. You can also join the usual Digg curation fun by Digging and burying stories and comments right on your iPhone. You know what’s great about this iPhone app? It interface well with the touch screen features of the iPhone. And if your scanning and browsing the highly active Digg storyline, you’d notice how easy it is to so by just tapping and swiping your iPhone’s screen. In case you’re not aware, Digg for iPhone app was created by the folks at TapTapTap. And to celebrate the release of their app, the group is giving away free iPads. Here’s how you can grab one of this most anticipated mobile device. 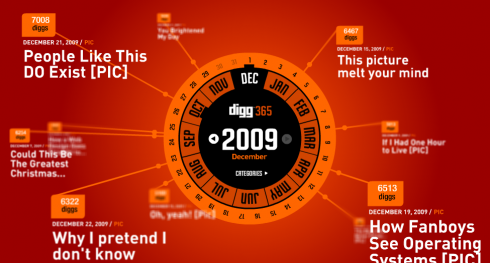 It was certainly a busy year for Digg as it struggles to stay relevant in 2009 with Facebook and Twitter getting too much attention in the social media scene. But with the year coming to a close, one thing is for sure – Diggers were still alive and kicking all through out the year. Digg’s user base increased to 40 million in 2009. Meaning more people are digging stories and making sure that intriguing stories get into the Digg headlines. And there were several enhancements as well on the social bookmarking site including integration with Facebook Connect, the launch of DiggBar, Digg Ads, Digg Trends as well as the revamped Digg search engine. To help us in visualizing the top stories that made it into Digg’s front page, Digg.com has launched a cool, interactive visualization tool that showcase the top stories at Digg in 2009. Â You can check out the top stories on daily and monthly basis. The top headlines were given plus the number of Diggs those headlines received. Clicking on each of the entries will bring you to the actual front page when the entries made it to Digg’s front page. Before Facebook started counting shares and Twitter started counting retweets, Digg pretty much invented social news. Sensing more mainstream services encroaching upon its turf, the geeky pioneer is not content to rest on its laurels. At a Web 2.0 Expo keynote today, Digg founder Kevin Rose and CEO Jay Adelson discussed new and future Digg features. Listen up for juicy tidbits on how to market your new media startup. 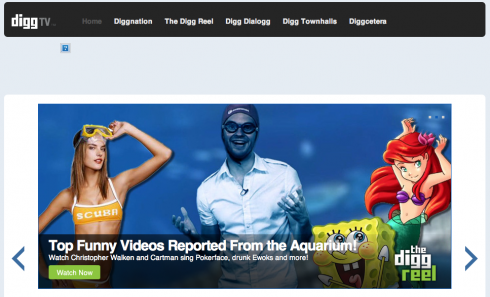 Are you a fan of Digg’s online TV shows – Diggnation, The Dig Reel, Digg Dialog, and Diggcetera? Â Then, you’ll Â be glad to know that Digg has rolled out a one-stop destination for all these shows – dubbed DiggTV.